As Election Day approaches, Department of Public Works Assistant Director Megan Moir keeps a section of the city’s water main nearby. She can show off the inside of the century-old metal pipe, which is caked with bulges of rust-colored accretion known as tuberculation. 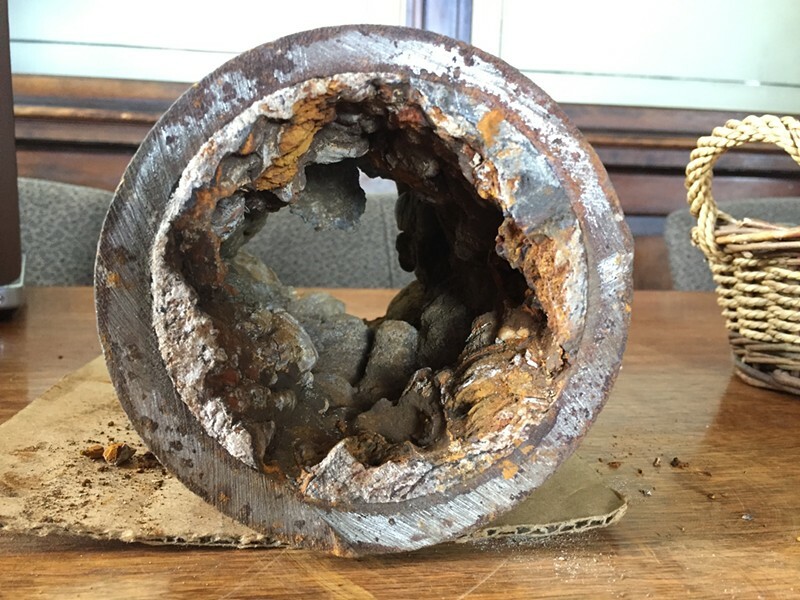 Burlington residents will vote on an $8.3 million bond Tuesday, and the pipe, which was removed from Pitkin Street earlier this year, offers a graphic example of the work left to do on the city’s aging water infrastructure. While Queen City citizens have kept a close eye on controversial ballot measures surrounding the Burlington Town Center redevelopment, ballot question No. 2 has largely passed under the radar. Moir attributes the lack of attention to an “out of sight, out of mind” mentality: “You don’t care about [the issue] until the water pipe breaks,” she said. 25 percent are more than a century old. The Department of Public Works has also received numerous citizen complaints of discolored drinking water, according to DPW Director Chapin Spencer. The rust buildups don’t pose a health hazard, Spencer noted, but they can add an unsightly brown tinge to the water. Clogged lines can also affect water pressure, a potential liability for the fire department as they connect to the water hydrants. The ballot measure is the result of a three-year process developing a longterm water system plan. DPW touts the bond as a proactive investment in Burlington’s infrastructure. To make the improvements, the city will be using Sanexen Aqua-Pipe, a technology to reline — rather than replace — the water mains. If approved, city workers would start next summer cleaning the pipes using high-pressure water jetting, then threading the lining through the pipes. The plastic liner is sealed to the pipe and hardened with hot water. The new process is much less disruptive to city streets, Moir said. Relining the pipes requires digging access points as little as every 600 feet, whereas open-trench replacement can shut down a street for days at a time. Once the lines are installed, the city would go forward with paving those same stretches of street. Repaving can weaken or even break subterranean waterlines, so fixing city streets while relining can help avoid digging up newly repaved surfaces, Spencer said. Moir pointed out a dozen locations where water mains broke just months after paving, forcing the city to dig up the street, repair the pipes and then repave. It’s the first time that the department has actively coordinated water pipe repairs with the city’s aboveground planning, Moir said. Much of the paving money, though, is in ballot item No. 1: A $27.5 million city bonding request for capital improvements, including new firetrucks, street repaving and sidewalk fixes. “By putting the work together, we’re reducing disruptions,” Spencer said. If the $8.3 million water bond passes, it would allow for the relining of eight miles of the city’s 110 miles of water pipeline — at a cost of about $177 a linear foot. The bond would mean slightly higher annual bills for ratepayers. Owners of a single-family home should expect to pay an additional $10 next year, increasing to about $30 annually in fiscal year 2020. The initiative would begin next summer. Ongoing investment is also needed. 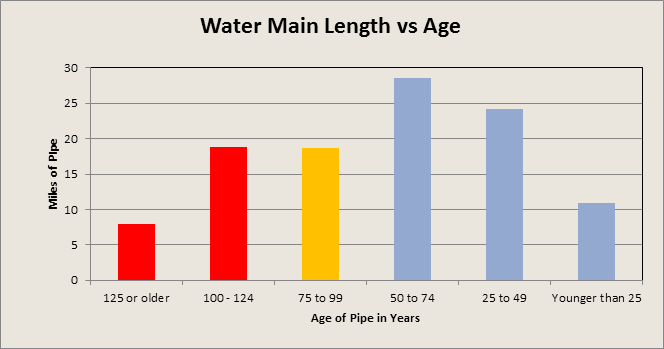 According to DPW’s calculations, the city would have to invest $2.3 million annually for the next 25 years to ensure that pipes are replaced, or relined, every 88 years. Moir said her department is looking into ways to cover such a plan without large tax increases. Previously, Burlington has been forced to take a piecemeal approach to correct short-term issues. During the winter of 2014-2015, frost penetrated more than five feet below the ground to the water pipelines, resulting in what DPW employees dubbed “frostpocalypse:” 48 line breaks, Spencer said, which left hundreds of residents without water. 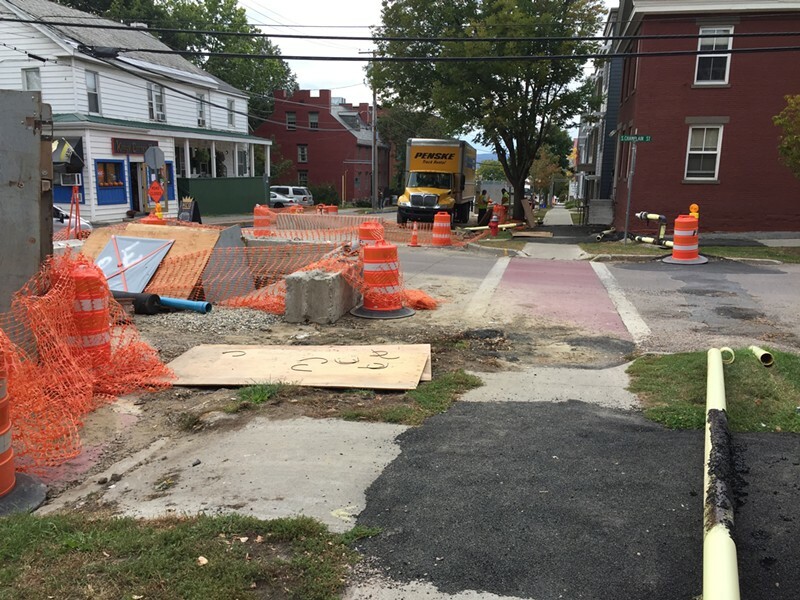 Moir acknowledged that the city’s work thus far has not been “without hiccups.” Residents complained of a lack of communication when the department repaired water lines on Pitkin Street and King Street this summer. But the new equipment is more pliable than the old pipes, meaning fewer breaks and less costly night and weekend work during the cold winter months, Spencer said.